با توجه به اهمیت بحث اثرگذاری آزادی تجاری بر اندازه دولت، مطالعه حاضر در تلاش است با استفاده از مدل رگرسیون انتقال ملایم (STR) و داده‌های فصلی 1369-1389 اثرگذاری غیرخطی آزادی تجاری بر اندازه دولت در ایران را مورد بررسی قرار دهد. نتایج حاصل از برآورد الگوی تحقیق نشان می‌دهد آزادی تجاری طی دوره مورد مطالعه به صورت نامتقارن و در قالب یک ساختار دو رژیمی بر اندازه دولت تأثیر گذاشته است؛ به ‌نحوی که آزادی تجاری در رژیم اول (هنگامی که حجم تجارت کمتر از 53/39 درصد GDP است) همگام با فرضیه کارایی اثر منفی و در رژیم دوم (هنگامی که حجم تجارت بیشتر از 53/39 درصد GDP است) همگام با فرضیه جبران اثر مثبتی بر اندازه دولت داشته است. همچنین نتایج بیانگر افزایش اندازه دولت در اثر افزایش سهم درآمدهای دولت و سرمایه‌گذاری از تولید ناخالص داخلی می‌باشد. Considering the importance of the relationship between government size and trade openness, this study has examined the nonlinearity effect of trade openness on the government size in Iran during the period 1991-2011. The results show that trade openness has an asymmetric effect on the government size in the form of a two regime model.Also, in the first regime (when trading volume is less than 39/53% of GDP), trade openness, consistent with the Efficiency Hypothesis, has negative effect on the government size. Whereas in the second regime (when trading volume is more than 39/53of GDP), trade openness, consistent with the Compensation Hypothesis, has positive effect on the government size. Finally, the results show that the size of government increases by increasing the share of government revenues and investment in GDP. 1-دادگر، یدالله؛ نظری، روح‌الله؛ «بررسی تأثیر جهانی شدن تجارت بر اندازه دولت در ایران»، فصلنامه پژوهش­نامه بازرگانی، 1387، شماره 12 (48). 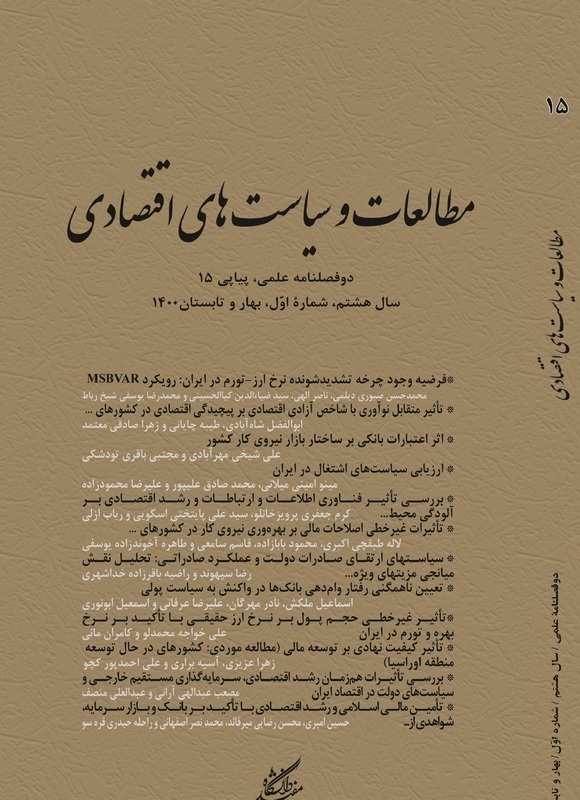 2-صادقی، حسن؛ صامتی، مجید؛ سامتی، مرتضی؛ «تأثیر جهانی شدن اقتصاد بر اندازه دولت (مطالعه کشورهای منتخب آسیایی)»، فصلنامه علمی پژوهشی رشد و توسعه اقتصادی، 1391، شماره 2 (6). 3-فلاحتی، علی؛ سپهبان قره‌بابا، اصغر؛ «اثرات آزادسازی‌های تجاری و مالی بر اندازه دولت (مطالعه موردی: ایران)»، مطالعات اقتصاد بین‌الملل، 1388، شماره 20 (35). 4-کریمی پتانلار، سعید؛ قادری، سامان؛ سنگین آبادی، بهرام؛ (1389)، «اثر جهانی شدن تجاری و مالی بر اندازه دولت در ایران»، اقتصاد و تجارت نوین، 1389، شماره 6 (21-22). 5-Abizadeh, S; 2005, "An Analysis of Government Expenditure and Trade Liberalization", Applied Economics, 37(16), pp. 1881-1884. 6-Adsera A. and Boix, C; 2002, Trade, Democracy, and the Size of the Public Sector: the Political Underpinnings of Openness, International Organization, 56(2),pp. 229-262. 7-Albertos, J. F; 2002, Explaining Economic Openness. The Political Sustainability of Internationalization in Latin America and Europe. In: Paper Presented at Advance Research Workshop, Florence, 16-22 May, 2002. 8-Alesina A, Perotti R; 1997, "The Welfare State and Competitiveness", American Economic Review, 87, pp. 921-939. 9-Alesina A. and Wacziarg, R; 1998, Openness, Country Size and Government, J Public Economics, 69, pp. 305-321. 10-Balle F. and Vaidya A; 2002, "A Regional Analysis of Openness and Government Size", Applied Economics Letters, 9(5), pp. 289-292. 11-Benarroch M. and Pandey, M; 2008, "Trade Openness and Government Size", Economics Letters, 101, pp.157-159. 12-Bretschger L. and Hettich F; 2002, "Globalization, Capital Mobility and Tax Competition: Theory and Evidence for OECD Countries", European Journal of Political Economy, 18, pp. 695-716. 13-Cameron, D; 1978, "The Expansion of the Public Economy: a Comparative Analysis", American Political Science Review, 72, pp. 1243-1261. 14-Clavallo, E; 2007, "Openness to Trade and Output Volatility: a Reassessment", IDB Research Department Working Paper 2007. 15-Epifani P. and Gancia, G; 2008, "Openness, Government Size and the Terms of Trade", IERE working paper no. 2008(359), University of Zurich. 16-Garen, J. and Trask, K; 2005, "Do More Open Economies Have Bigger Governments? Another look",Journal Development Economics, 77:533-551. 17-Garrett, G; 2001, "Globalization and Government Spending Around the World", Studies in Comparative International Development, 35(4), pp. 3-29. 19-Islam, M. Q; 2004, "The Long Run Relationship between Openness and Government Size: evidence from bounds test", Applied Economics, 36, pp. 995-1000. 20-Iversen T. and Cusack T; 2000, "The Causes of Welfare State Expansion: Deindustrialization or Globalization? ", World Politics, 52, pp. 313-349. 21-Katzenstein, P; 1985, Small States in World Markets: Industrial Policy in Europe, Cornell University Press, Ithaca. 22-Kueh J. S. H.; Puah C. H. and Wong C. M; 2008, "Bounds Estimation for Trade Openness and Government Expenditure Nexus of ASEAN-4 Countries", working paper No. 2008(12351), MPRA. 23-Liberati, P; 2007, "Trade Openness, Capital Openness and Government Size", J Public Policy, 27, pp. 215–247. 24-Lin, C-F.J. and Terasvirta, T; 1994, "Testing the Constancy of Regression Parameters Against Continuous Structural Change", Journal of Econometrics, 62, PP. 211-228. 25-Meinhard, S. and Potrafke, N; 2011, "The Globalization-Welfare State Nexus Reconsidered", University of Konstanz, Department of Economics, Working Paper Series 2011-2027. 26-Molana H.; Montagna C. and Violato, M; 2004, "On the Causal Relationship between Trade Openness and Government Size: Evidence from 23 OECD Countries", Discussion Paper no. 2004 (164), and University of Dundee. 27-Persson T, Tabellini G; 1992, "The Politics of 1992: Fiscal Policy and European Integration", Review Economics Studies, 59, PP. 689-701. 28-Rodrik, D; 1998, "Why Do More Open Economies Have Bigger Governments? ", J Political Economics, 106(5), pp. 997-1032. 29-Schulze G. and Ursprung, H. W; 1999, "Globalization of the Economy and the Nation State", World Economics, 22, pp. 295-352. 30-Tanzi, V; 2004, "Globalization and the Need for Fiscal Reform in Development Countries", INTAL-ITD, Occasional paper-Siti-06. 31-Ter¨asvirta, T; 2004, "Smooth Transition Regression Modeling", in H. L¨utkepohl and M. Kratzig (eds); Applied Time Series Econometrics, Cambridge University Press, Cambridge, 17. 32-van Dijk, D; 1999, "Smooth Transition Models: Extensions and Outlier Robust Inference", PhD Thesis, Erasmus University Rotterdam, publishing.eur.nl/ir/repub /asset/1856/fewdis 20020501113139.pdf. 33-Van Dijk, D., Trasvirta, T. and Franses, P. H; 2000, "Smooth Transition Autoregressive Models-a Survey of Recent Developments", Econometric Reviews, 21, PP. 1-47. 34-Wilson, J. D; 1987, "Trade, Capital Mobility and Tax Competition", J Political Economics, 95, pp. 835-856. 35-Zakaria, M. and Shakoor, S; 2011, "Relationship Between Government Size and Trade Openness: Evidence from Pakistan", Transit Studies Review, 18, pp. 328-341.